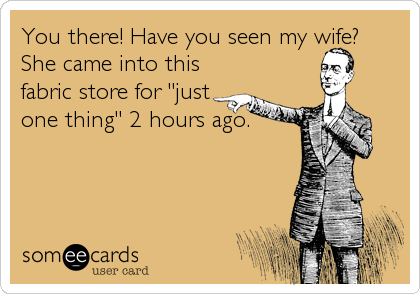 Who doesn’t love those illustrated ecards that float around the internet? 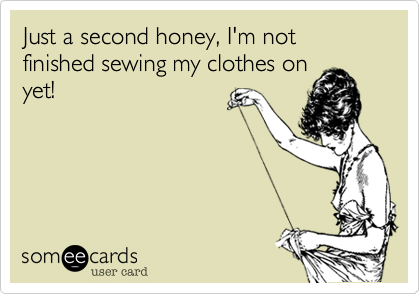 I’ve seen so many funny sewing ecards, but often when I want to find them again, I can’t. 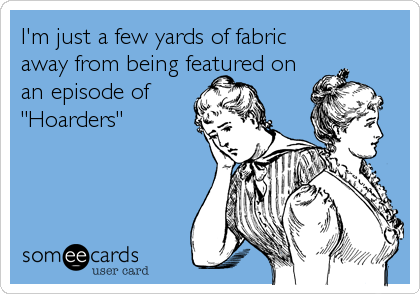 So I went to the Someecards site and below I’ve compiled for you the best selection of sewing humor I found there. You can click on any of the images below to go to the image page and share from there. 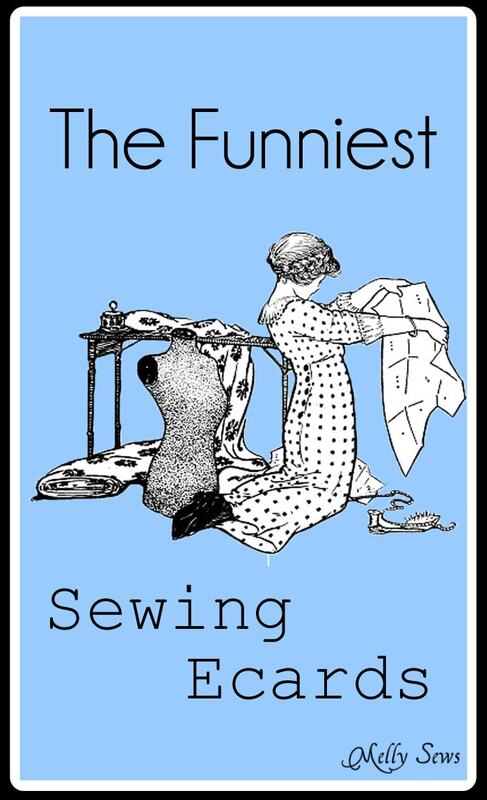 And who hasn’t heard “Oh, I bet you would love to…” when someone learns that you sew? One time I caught a student using fabric scissors on FLORAL WIRE!!!! 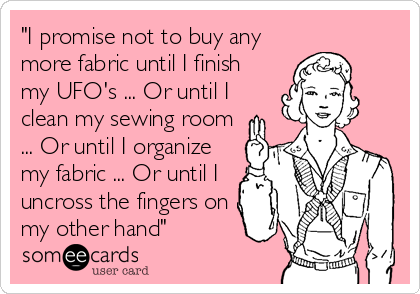 This one should be obvious – sew first, sew forever! Unless it makes you realize this. 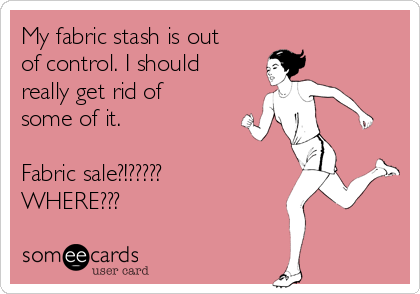 But who can resist the siren call of a fabric sale? And some fabric store employees don’t make it easier. But we always get found out when this happens. These were hilarious! I shared a few with my husband. 😉 Thanks for sharing. O.K. So why am I feeling so guilty right now? Because I identify with so many of these! Loving it! Thanks for the laughs. Thanks for the laughs – spot on! I laughed so hard. I am one of those who thinks no material shall be sown to until it is properly aged in a dark drawer. Agreed? 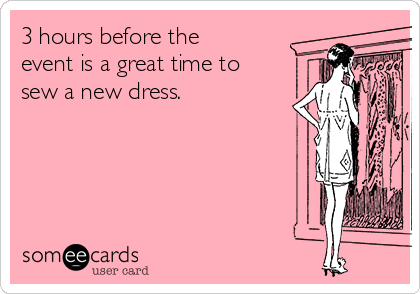 For me it was a ball gown the night before and day of !!!! I sat through my lunch break sewing the hem along with a colleague. It also continued on the bus ride home. It was in the 80s which meant it was a “merangue” I was sitting in my robe post shower and wet hair still in a towel whilst stitching in the lining !!!!! We made it on time and my colleague kept grinning at me as she knew what I had achieved in a small amount of time. 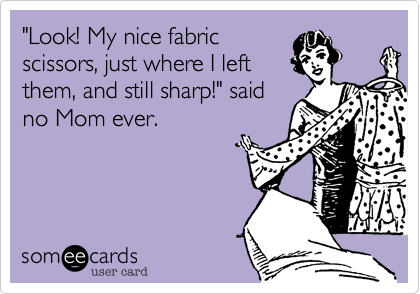 Oh yes fabric addict and hoarder. Well, that sounds familiar. I have learned how to make outfits with minimal machine work. Jackets are a key component, covers a lot of sins. I can identify with so many of these…LOL, I thought I was only the guilty one. Machine really needs a backup beeping sound when the bobbin gets low! Mine does & I am so glad! I’ve never meant to sew past an empty bobbin but have on a few occasions & learned to pay closer attention to it! My new to me Viking has the warning beep on it now. Lol! Love it! I so agree with you! Im a beginner at quilting and sewing and only at the age of 61 have I realised why my mother would yell from the other room… Bobbin! Noooo! I actually called out YESSSS! I MADE IT! 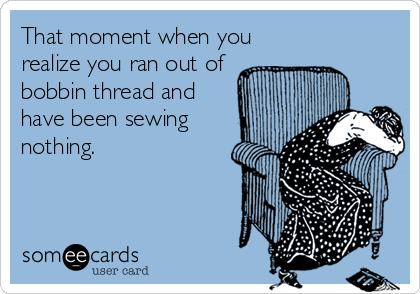 the other day when my bobbin gave out just as I finished my seam. Its like a contest now to see how well I can time it. I can usually tell that I HAVE BEEN sewing without bobbin because the machine sews perfectly and the stitching seems to be so nice and straight!! Ha!! 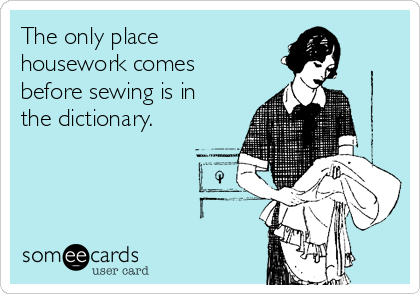 I always cringe a little when people learn that I sew. 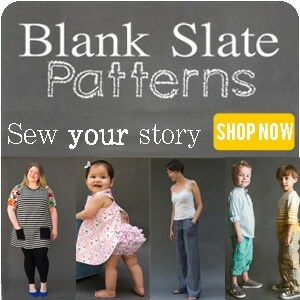 For, in that split second, all of my time to sew becomes my time to sew for them FOR FREE!!!!!! 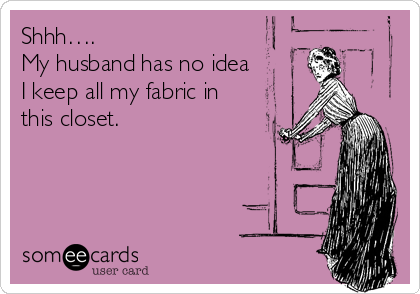 And please don’t make me do a fabric intervention! I love my hoards of fabric. It magically transforms into a work of art! hilarious!! and true and relatable, and been there on so many levels!! Hopefully non-sewers may understand that we are like most sewers! When people ask me to hem pants for them or whip up a quilt, I jokingly tell them that I hem pants in exchange for cleaning my house. That changes their attitude. Work is work if it’s not my creative outlet. Sorry not sorry. Fantastic why couldn’t I have come up with something like that ! Ohh sewing for cakes would be good too. Cant cook but boy do I love my sewing. I look at my fabrics and wonder why I bought 7.35 yards and not remember the project I bought it for. I did exactly that two years ago. Now I am searching my patchwork patterns to fine a suitable project. Too funny! Yay, I’m not the only one! Omg, the last one is the story of my husband’s life! It’s nice to know I’m not the only one out there that these apply to. I hate to say it, but there are time that I hide the fact that I sew from people that I don’t know very well. Because once they do find out. 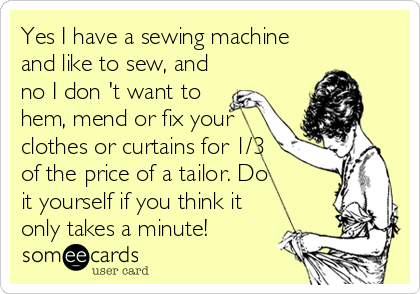 I also hear the hemming, altering and replacing button requests. I had one co-worker ask me if I could make a duvet cover, pillow shams and matching curting for her. She didn’t want to take it to a professional tailor because it was too expensive!!!!. I hemmed and hawed (no pun intended) until she finally stopped asking. I’ll never forget the ride to my high school graduation – my aunt hemming my graduation dress from one direction and me from the other, while I was wearing it! We finished in time and I have graduation pictures in my beautiful dress. All so true. I collect old trunks and use them as coffee table and seats because they hide fabric and yarn stashes. I had pulled the final basting threads out of my Prom dress on the way to pictures! 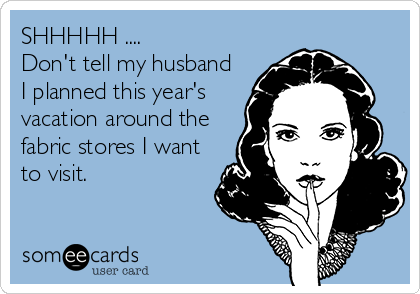 I pay cash for some of my craft supplies and fabric, that way my husband doesn’t know how much I really spend. Love all the cards…kind of been there. 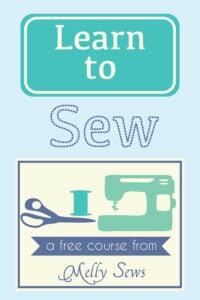 I’ve heard that when you buy fabric and stored it for a year or more-the projects you make with it are free! I love furoshuki! That’s the square fabric Japanese use for gift giving – beautiful fabric, so eco-friendly. My gifts with them as wrapping are ooh-ed and awhh-ed over. Each furoshuki is either returned to me by family or I encourage others to use for wrapping to give their gifts away. ….anyway, I really LOVE the double sided cloths, because when knots are tied at the top, the reverse side can be turned out to show the contrasting colors, — but they are extremely expensive to buy on line – upwards of $15, usually more like $50….. But wait, I could make my own double-sided furoshuki, couldn’t I? Now I have my stash of outstanding one-yards of silks, poly, even flannels. I keep seeing one more, than one more lovely fabric pattern. Hours have been spent matching the bright golds to the printed blacks or olives, the peach flowered patterns with the soft moss solid. I had them all wrapped up in a huge furoshuki and tucked under my bed.. but every once in awhile I have to pull them out to unwrap just to see and feel the textures. Have I made my homemade furoshuki? or gifts of bundles of these eco-friendly wrapping? Of course, not. But what a delight to find one more yard of remnant to add to my stash !! Yes, tomorrow, I will begin to sew…..They will be beautiful….but should I use the purple silk with a gold brocade backing? or the bright red print with an orange? And I could do a little embroidery on the corners, couldn’t I? I’ll have to get more floss… and new needles and a new leather thimble, right? Lol! Love these! Wish there were some scripted also for the men who sew such as myself! Maybe I should script and create some of my own! I will get to that project once I complete the project of finding storage spaces for my current fabric after I return from the fabric store. Oh did I mention there was a sale? Lol! I read these, laughed until I almost couldn’t hold my water, and then started wondering if someone has been spying on me. Just in case someone is spying on me could you please come in and help me refold my stash. I keep it in a dark place, and I could swear that it unfolds when I’m not looking. Thanks so much for the laughs. I found them when I needed them. I sure do appreciate your droll sense of humor. enjoy a feeling of satisfaction and accomplishment after each is finished. Is there anyone else who keeps reorganizing their stash; or finds that the stash spreads to different rooms in the house. It’s nice to have company. Wow….someone just crept into my life…..these are ALL about my life! And like these? I just laugh at them! 3 sewing machines, 2 sergers and they all have names. Fabric everywhere. sewing Room 15 x 25. Life is good!!!!!!!!!! TV with a movie on. I actually AM a hoarder who finally managed to stop earlier this year. I had to send the hoarding one to my organizer who is still a little befuddled that I still have enough fabric to sew for years. It’s just impossible to explain. 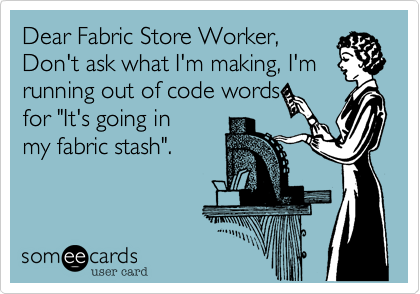 However, I now stay clear of fabric stores. I do spend a lot of time on fabric.com just dreaming. 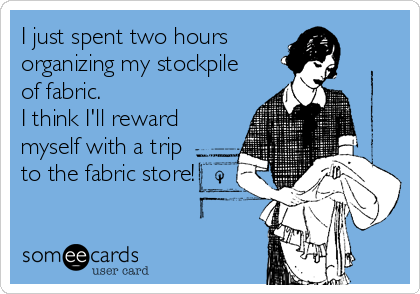 And now I can get to my favorite fabric. My hoard contained my inherited stashes from my mom, grandma and great aunt going back to the 30’s. Now I have set them free to go in someone else’s stash to hopefully become gorgeous quilts. I don’t quilt, by the way.